This is the fifth movie in the Pokemon franchise. If you don't know what Pokemon is by now, then stop reading this website and vacate your missile silo, stat. Ash and crew have now landed in Altomare, a city of vast water canals and mazes. But there is an insidious plot underfoot as the two slick thieves Annie and Oakley plan to steal a powerful magical jewel, the Soul Dew, being guarded by two new Pokemon, Latios and Latias. Ash and the rest of the gang find themselves in the thick of the action as they try to stop the thieves and save Altomare. With this, the fifth theatrical installment in the Pokemon franchise, not much new ground gets broken. It seems almost as if there exists a formula for the creation of Pokemon films: place Ash and his friends in a new locale, introduce some new (often Team Rocket related) city and/or world threatening conflict, introduce some new all-powerful Pokemon, and throw Ash and Pikachu in the middle of the fray. However, let's take a closer look at the formula's application in this instance. This time around, the new locale is Altomare, a very thinly-veiled Pokemon-version of Venice. Despite the blatant replication of a real-life city in animated format, this set piece works rather nicely. Another note-worthy set piece is the secret residence of Latios and Latias, a hidden garden full of vibrant green trees and brilliant blue water canals. The animation is up to snuff as well, being vibrant, colorful, and attractive, save for some bold CGI work that sometimes doesn't blend quite that well. In fact, the locations and animation used in the film work well at helping establish some really good atmosphere. However, poor characterization and a severely cliched plot quickly snuff out all that good atmosphere. Plotwise, this film is very similar to all the former Pokemon movies. At the crux of all the action in all the films in this franchise are extremely powerful Pokemon, and this one is no different. Basically the gang waltzes into Altomare, some catastrophe ensues, and the all-powerful Pokemon play a big role in saving the day. There are a few twists, such as Latios and Latias being much more human-friendly than most of the all-powerful Pokemon of the previous films. This gives us a lot of face-time with both of them and improves the audience's understanding of the motivations they have in saving Altomare and their human companions. It isn't enough to save this tried and tired story though, as we have seen nearly identical movements many times before. The first time around it might have been novel, but by the fifth spin on the same general narrative it just becomes drudgery. The characters here are a mixed bag. The characters of the previous films and television series, such as Ash, Misty, and Brock, are eminently likeable and continue to exude caring and benevolent vibes. It was the not-so-slick thieves Annie and Oakley that just don't come off well. For one, their dialogue was more than a little cheesy (not that the dialogue in any Pokemon film is stellar). Their biggest detraction though is that at some points of the show they are utterly inept in mundane endeavors while in other portions they are insanely proficient in remarkably difficult situations. Early on in the show (and much closer to the end), they are rather easily bested by Ash and Pikachu, which of course doesn't bode well for their ability. However, in the middle of the movie they capture the very powerful Latios without so much as breaking a sweat. Essentially they come off as rather unbelievable. Additionally, we see very little of James, Jesse, and Meowth, save for some comedy relief, though this has been the case all too often in the more recent Pokemon films. 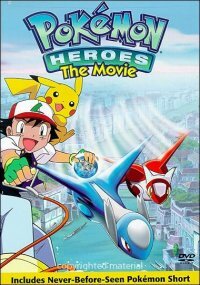 As much as I have dug on Pokemon Heroes, it is by and large a decent film. It was somewhat engaging because at least some of the characters were up to par and the visuals were impressive. And at a scant 71-minute run-time, this film is short and to the point, a saving grace for what amounted to little more than rehash. Recommended Audience: Very little along the way of objectionable content unless you are very sensitive. Appropriate for pretty much all ages.